After you've gathered supplies, clean the jar thoroughly and peel off any labels or stickers. Dry completely. 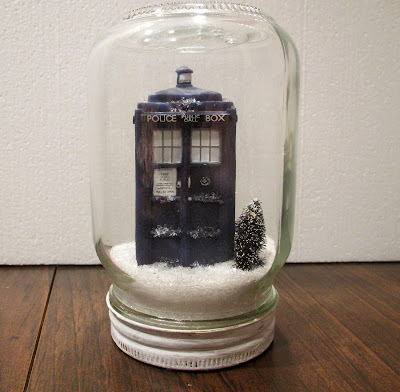 Open your TARDIS and make sure it fits into the pint jar. Just in case. Lay down newspaper because you're about to open the glitter and that gets dangerous. 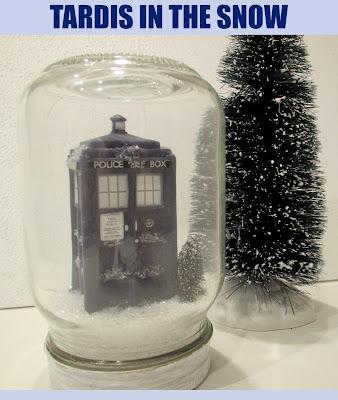 The panes of the TARDIS need a little snow. Paint thin lines of Mod Podge along the panes and top corners - anywhere you want to see a dusting of snow. Work fast before it dries. While the Mod Podge is still wet, sprinkle Diamond Dust glitter all over the TARDIS. Give it a few seconds to stick and shake off any excess. After the TARDIS dries, it's time to glue it to the inside of the jar's lid. I put a square of foam under the TARDIS to raise the height to make sure the spaceship wouldn't be buried underneath snow. 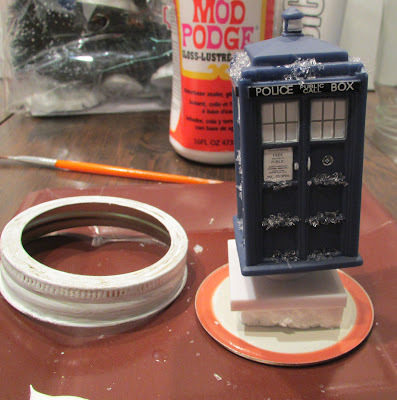 I glued the foam to the lid and then glued the TARDIS to the top of the foam. While the glue dries thoroughly, you can use the time to paint the ring of the jar white if you want. I prefered this over the gold color but it's entirely up to you. 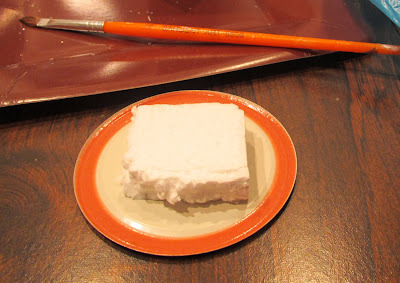 I used a couple of layers of white acrylic paint and smudged it with a paper towel while it was drying. 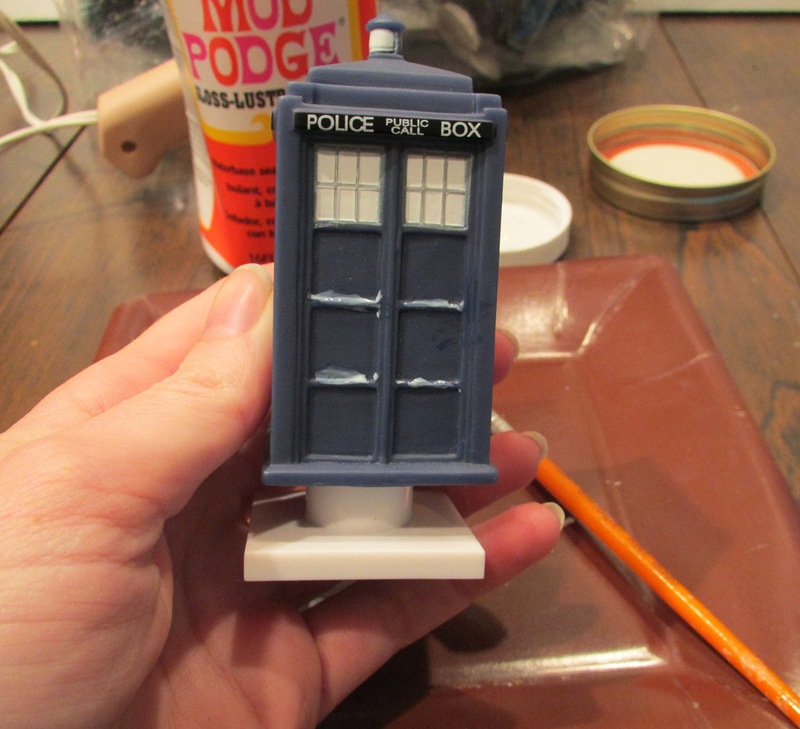 My TARDIS took up too much room (bigger on the outside) and since I didn't have room for any trees - not even the smallest size - I broke a small one in half and glued it to the corner of the TARDIS. While it's drying, pour Diamond Dust glitter into your empty pint jar until it comes to approximately half an inch. It's hard to be precise until you see the TARDIS in the jar. 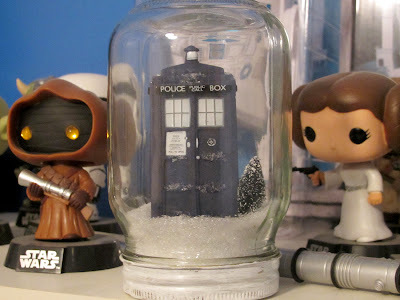 When everything is dry, put the lid on (the TARDIS will be upside down) and screw it on. Slowly shake the snow/glitter down and see how it settles. If it's too much, unscrew the lid and carefully dump it back into the jar. If it's not enough, add more as necessary. It looks right at home on a shelf with Leia and Jawas!! Guys - Leia as a companion. Could you imagine? 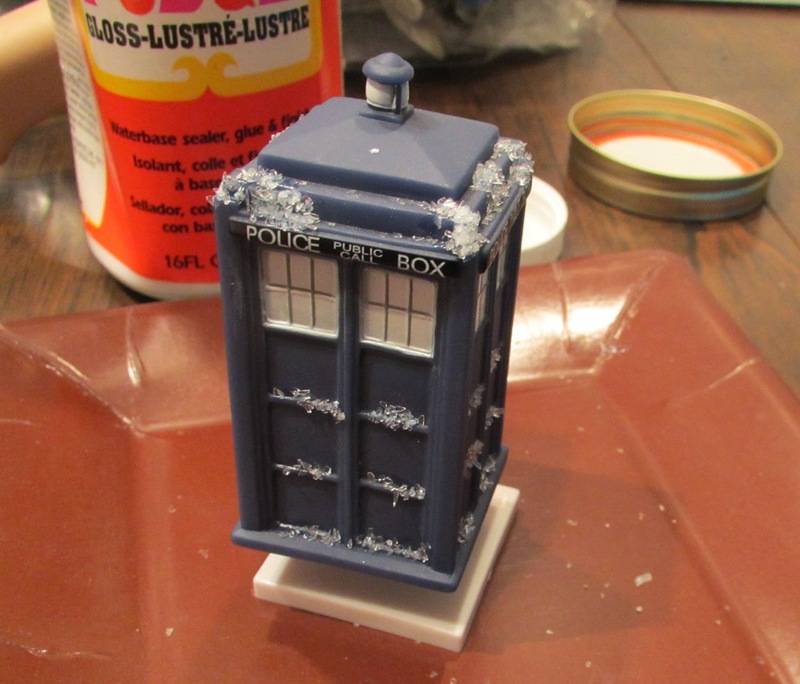 If you get a smaller TARDIS you could add a lamp post, more trees, a wreath, tiny Christmas lights - there are tons of possibilities. 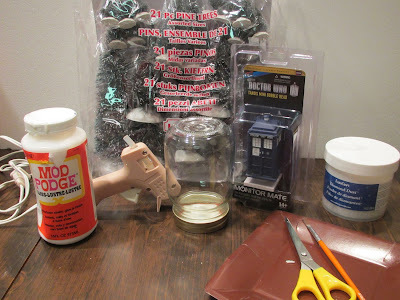 You can also apply this tutorial to an AT-AT, the Millennium Falcon, all the miniature geeky things! Put it in a jar is going to be the next "put a bird on it." Additionally, I believe you only need to take a few more steps to turn the jar into a snow globe. Happy crafting! Robots would be awesome! I think I spent about half an hour working on this but gathering supplies required a bit of errand-running. Ahh I need to try this!